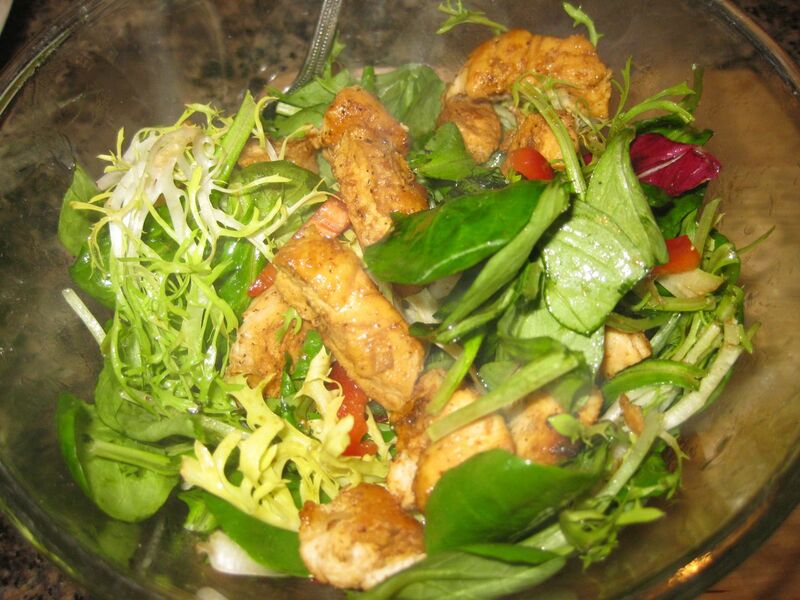 Crispy bits of applewood smoked bacon and chunks of chicken breast nestled in a lush bed of mixed greens. A small fistful of fresh basil. A jar of leftover balsamic vinaigrette. Shared lunch! I love it when we’re both home at lunch time, and I can mix up a huge salad in one big bowl, and we can snuggle up and eat it together. We were out of lettuce, so I turned to my favorite lettuce stand-in, celery. I figured out a while back that celery salads are really incredible. Super crunchy, so you can go a little crazier with the beans, avocado, and other creamy ingredients. Celery also doesn’t wilt, so the leftovers are tasty, and you can play with dressing it when you make it instead of carting the dressing along. The flavor of celery works particularly well with lemon, but I didn’t have any. I didn’t even have a lime or a grapefruit to substitute, so I decided to try a simple rice wine vinaigrette instead. 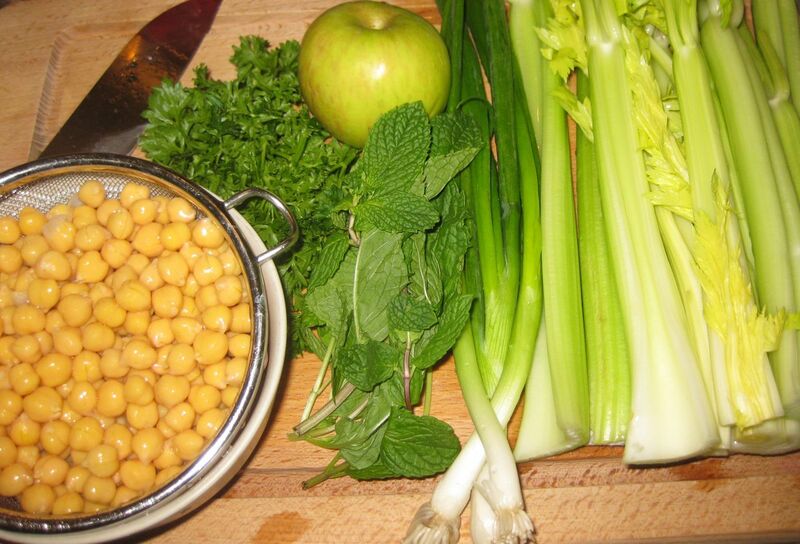 I added garbanzo beans, lots of mint and parsley, scallions, and an apple for a little sweetness. 1 head of celery, chopped. 1 can of garbanzo beans, rinsed and drained. 1 apple, quartered, cored, and chopped. 1 fistful of parsley, chopped. 3T extra virgin olive oil. 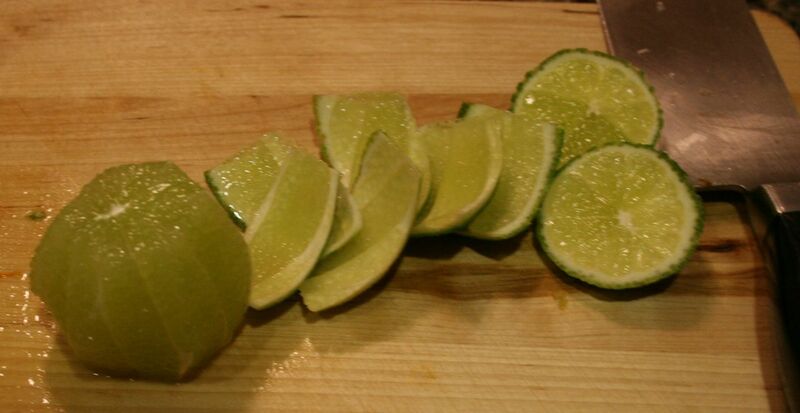 This was a chopping frenzy. I started by rinsing the garbanzo beans and setting them aside to drain. I prepared my rice wine vinaigrette in a small jar. Then I turned berserker with my favorite knife. 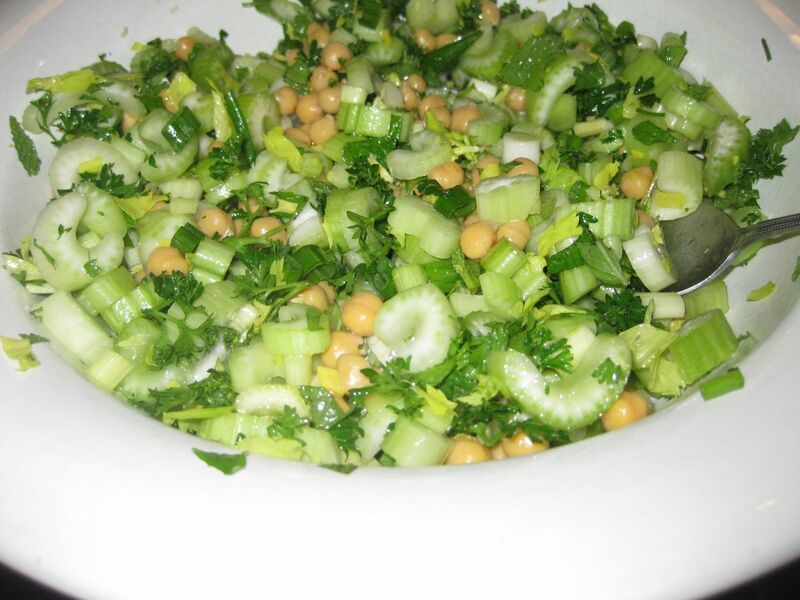 I transferred my mountains of chopped celery and apple and scallions and herbs to the big bowl as I went, adding the drained garbanzo beans just before shaking up the vinaigrette and drizzling it over the salad. Please note that this salad serves two, and use half the main ingredients if you’re fixing it for one. 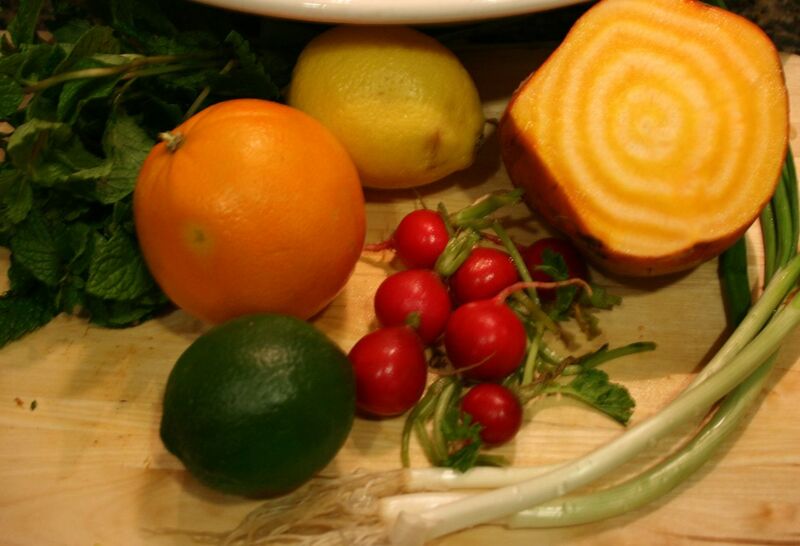 Feel free to make a normal batch of vinaigrette, since it keep well for several days. I was surprised by how delightful the rice wine vinaigrette and apple were. 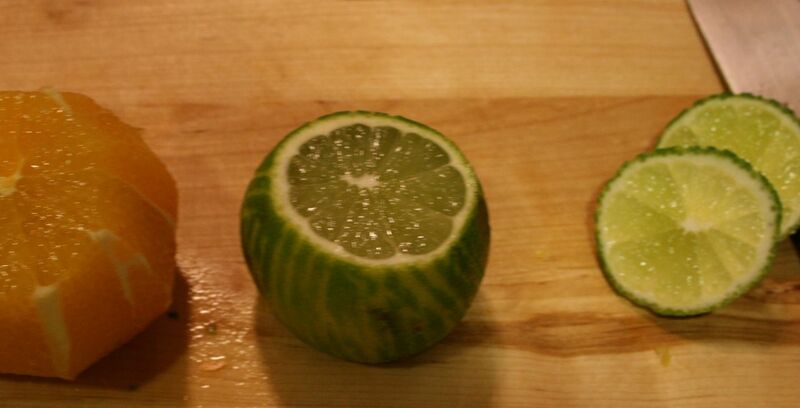 They worked incredibly well — it was more delicate than the bright lemon version I usually make, and I loved it. The apple was a great addition, with it’s sweetness and the contrasting crunch. The fresh herbs brought the salad to life, and the creamy garbanzo beans made it remarkably filling, even hearty. My husband and I ate every bite. It was just that yummy. This is the easiest salad to pack to go — it is actually fine to dress it when you pack it. I like how the celery soaks up the vinaigrette. If it will be sitting for more than a few hours, the herbs will wilt, so if that bothers you, keep the dressing in a separate jar, and combine before you eat it. We’d all had a big lunch, so I wanted a simple dinner. The kids were happy with sandwiches and fruit, but I craved vegetables. I decided to make a slightly elegant salad — less is more — drenched in a good balsamic vinaigrette. 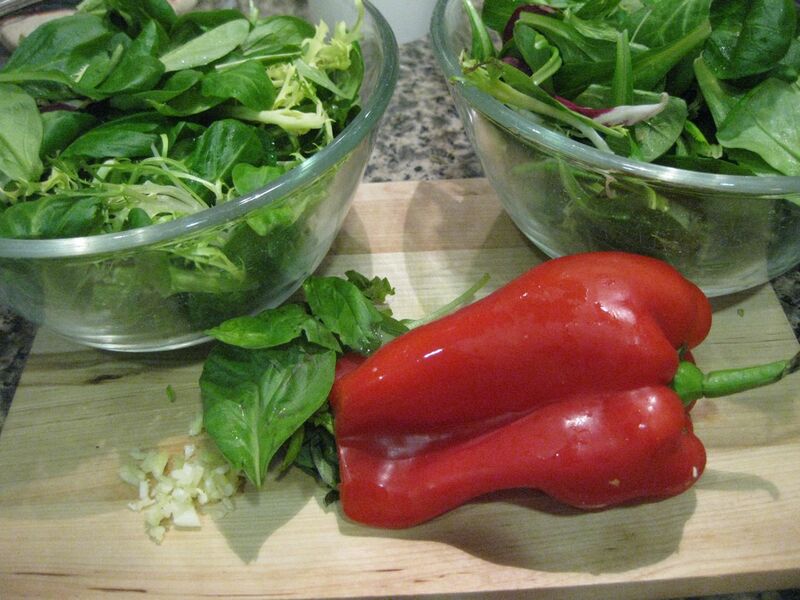 The red bell pepper and basil are ready -- time to chop. 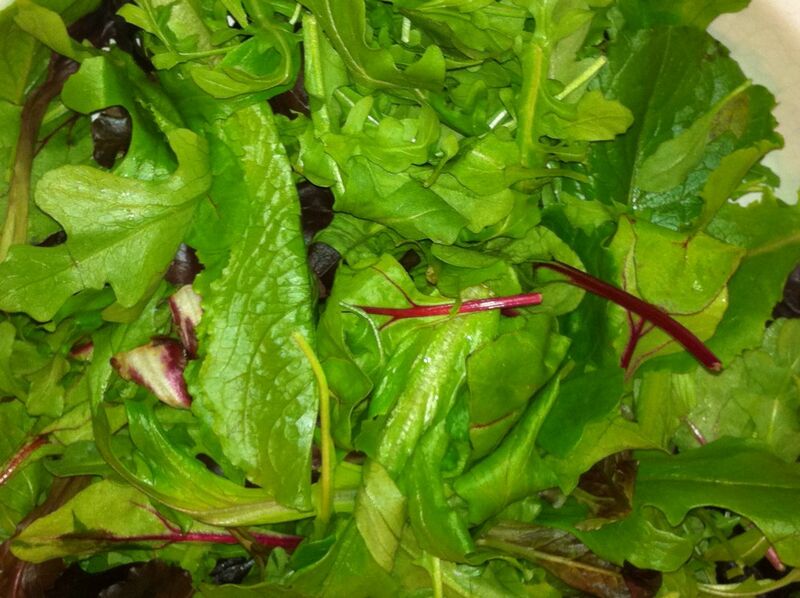 3-4 cups mache and mixed greens. 1/2 red bell pepper, sliced. 1/2 fistful of basil, chopped. 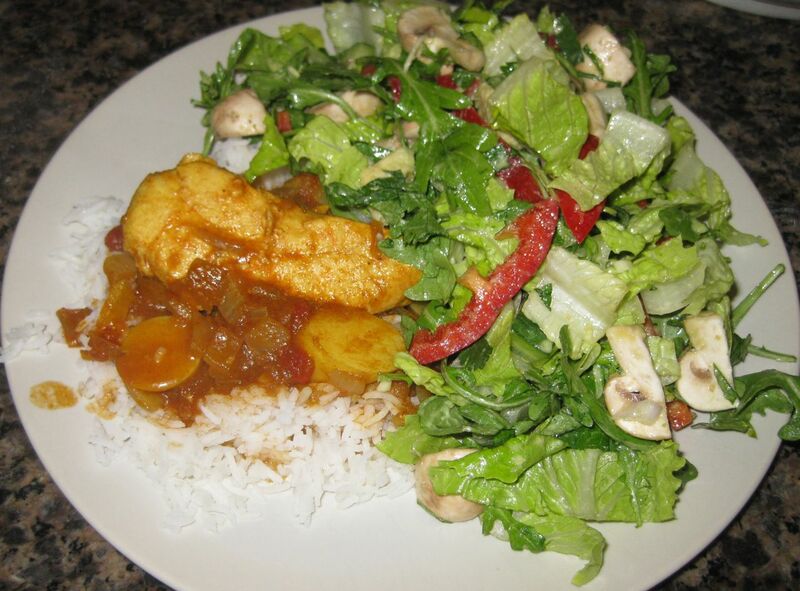 2 small chicken tenderloins (fresh or frozen). 1T butter for cooking the chicken. Garlic powder for the chicken, to taste. Pinch of salt for the chicken, to taste. I doubled all of the ingredients listed above and made two salads. 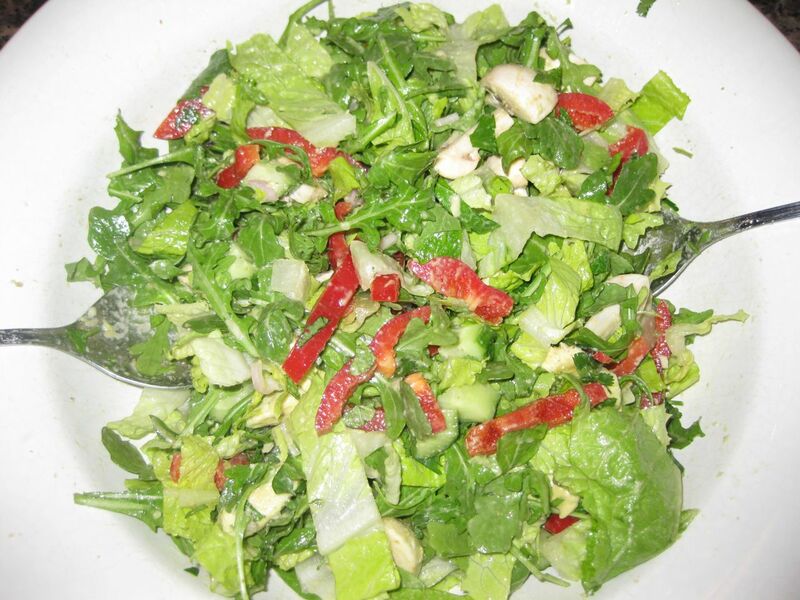 First I mixed up the vinaigrette, giving the garlic time to mellow and infuse the salad dressing with flavor. Then I cooked the chicken. I keep a bag of the Trader Joe’s frozen chicken breast tenderloins in the freezer, and I use the following method when I don’t have time to bother with defrosting the chicken. I melted the butter in a stainless steel frying pan over medium heat, and added the frozen chicken just as the butter began bubbling. I sprinkled salt and garlic powder over the chicken tenderloins, and let them cook while I chopped the bell pepper. When the chicken was nice and brown on the bottom, I flipped the tenderloins over and lightly seasoned the other side. I chopped up the basil and cleaned up my salad prep area, and then I checked on the chicken. Once it had browned on the other side, I used a pair of kitchen shears to snip it into bite-sized pieces. My chicken was still raw in the center, so I stirred it around a bit, turned the heat to low, and covered it. If you use fresh chicken instead of frozen, you can probably skip that last step. After a few minutes on low, I took off the lid and turned off the heat. I added the vinaigrette, a dusting of freshly cracked black pepper, and the hot, juicy chicken to the salads, and served them right away. 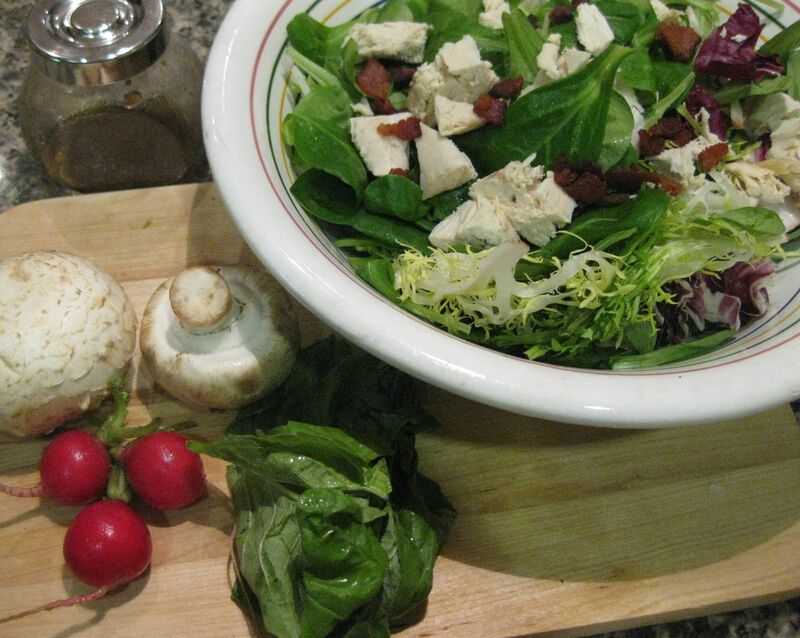 There is nothing like homemade balsamic vinaigrette. It was my gateway salad dressing — the one I absolutely had to learn how to make, and the one I spent years playing with and refining. 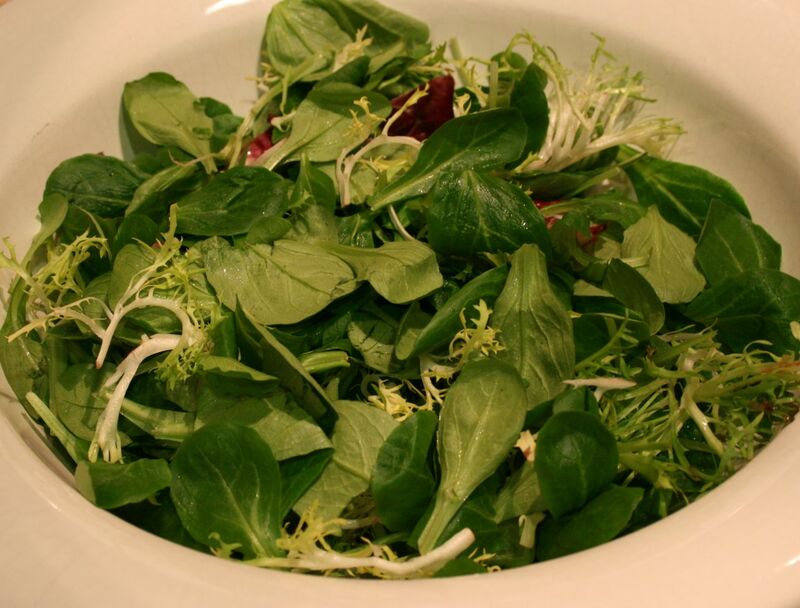 It’s friendly, and works well with all kinds of fruits, vegetables and flavor palettes, but sometimes, I have to make a salad where the balsamic vinaigrette is the star. This was one of those salads. It all worked very well together. The juicy chicken soaked up just enough dressing to really sparkle. The tender mache paired nicely with the crispy red bell peppers, and the basil brought all the flavors together. 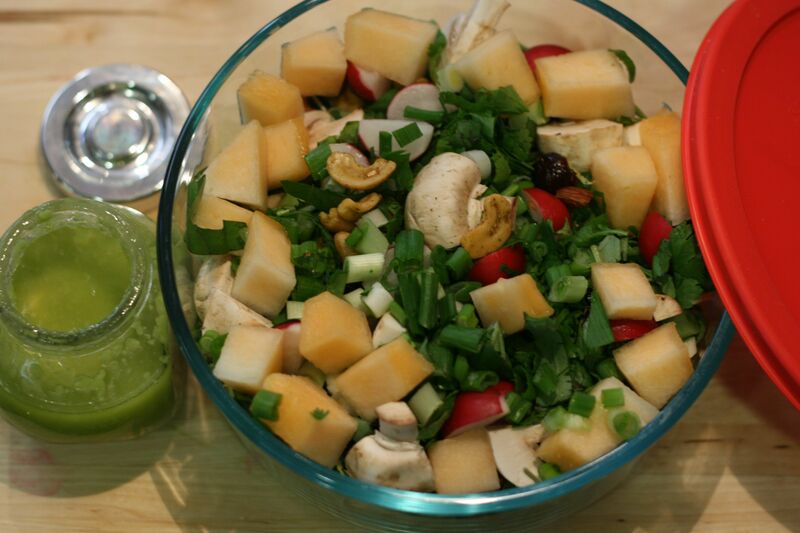 If the ingredients in my fridge ever align just right, I will happily make this salad again. Done. For a vegetarian version, replace the chicken with either kidney beans, goat cheese, or feta cheese. This would be very easy to pack to go. The chicken will be cold, but it will still taste delicious. 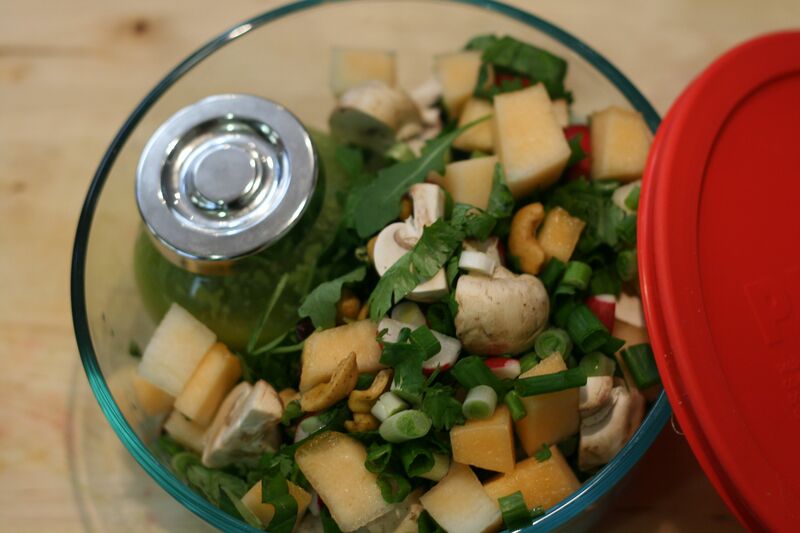 Just keep the vinaigrette and the salad in separate containers until ready to serve (I recommend making the dressing in a small glass jar, and preparing the salad in a large glass or stainless steel container with a tupperware-style lid.) Use only as much vinaigrette as you need, fork toss or pop the salad container lid back on and give it a few good shakes, then eat and enjoy. We had a couple of good friends over for dinner, and an almost empty fridge. 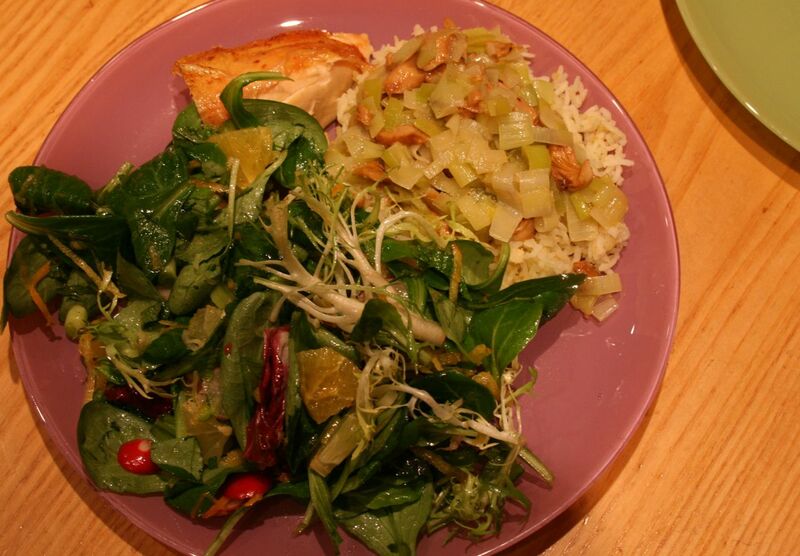 I knew I could pull a salad together, and I wanted it to have some protein so that our vegetarian friend wouldn’t feel deprived while the rest of us munched on sausages. I decided to go for the goat cheese, and I added the cranberries and olives to the salad because I adore really strong sweet and salty flavors with creamy goat cheese. Fresh herbs and balsamic vinaigrette tied it all together. 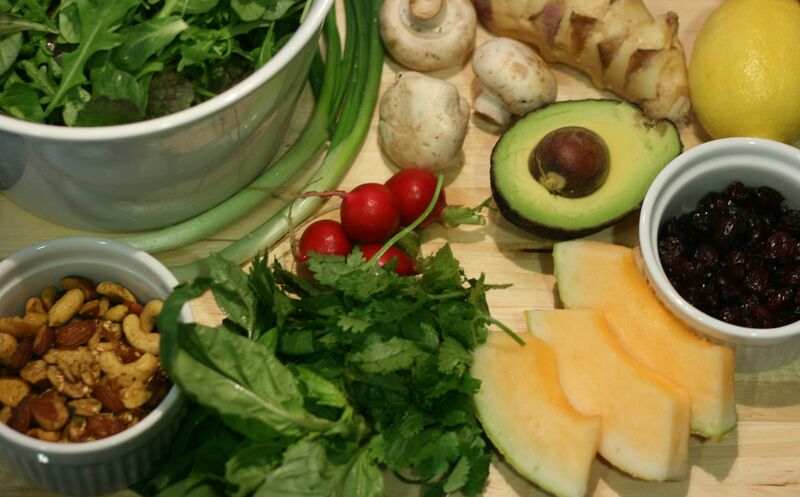 Salad ingredients are ready for action! 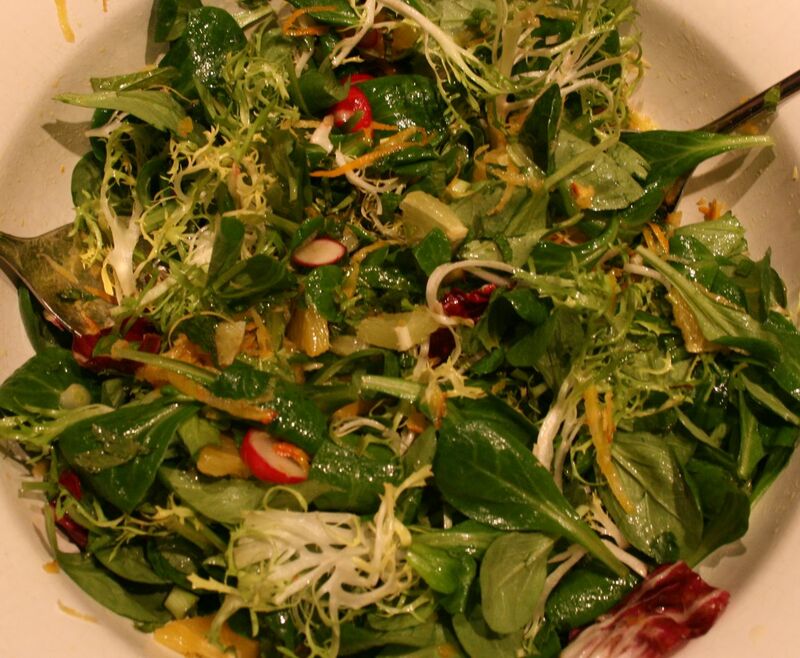 A gorgeous bed of mixed salad greens. 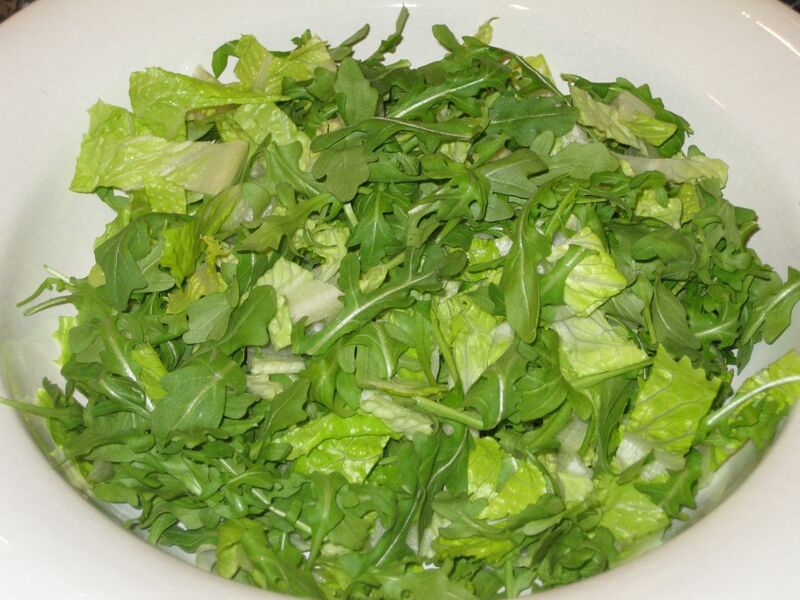 4-6 cups of arugula and mixed baby greens. 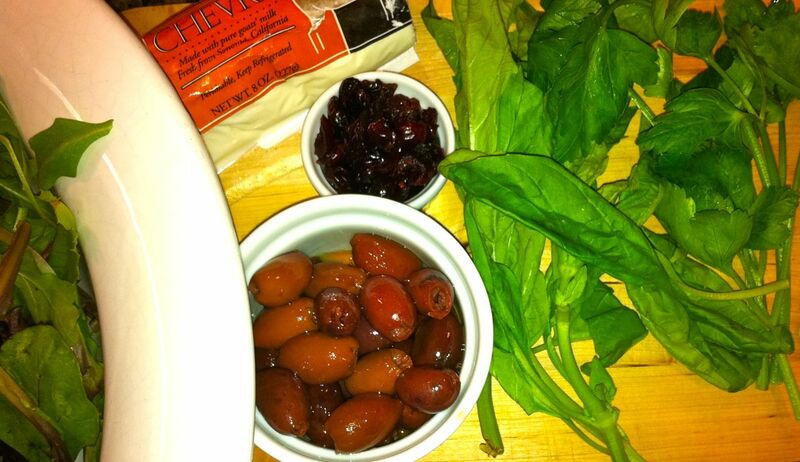 1 cup pitted kalamata olives. 1 T dried, sweetened cranberries. 1 fistful of italian parsley. 1/2 clove of garlic, crushed and minced. This was a really easy salad to make. 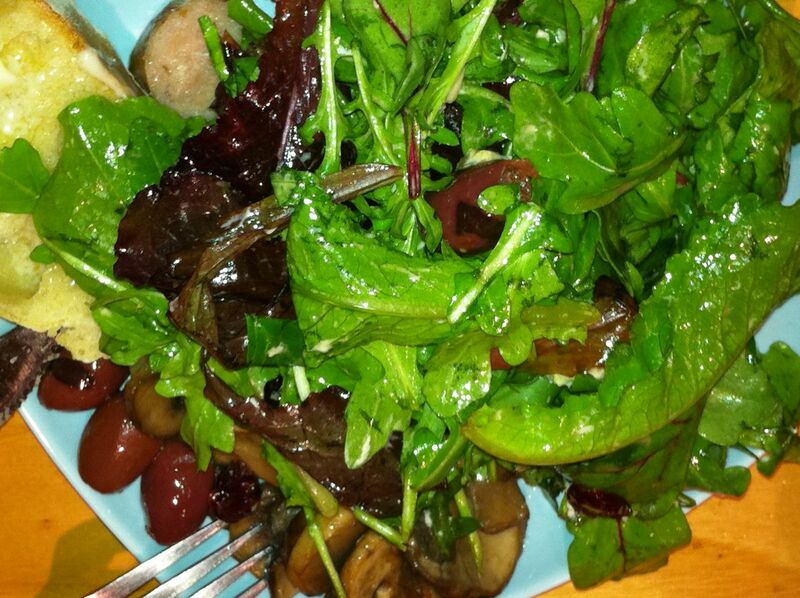 I mixed up my vinaigrette, and created a lush bed of greens. 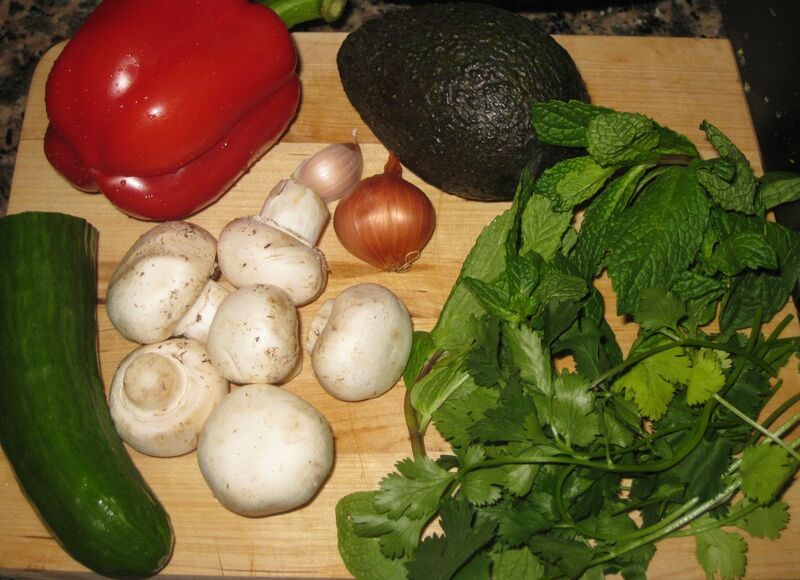 Then I just chopped my herbs and added everything to the greens. We ate this with warm sourdough bread slathered with butter, chicken apple sausage wheels, and delicious mushrooms sauteed in butter with garlic. On the plate, ready to enjoy. The flavors here we spectacular. I broke my own rules, though, and regretted it. Do you see what I forgot? Salads really need crunch. The baby greens and arugula were incredibly tasty with the goat cheese and the rich flavors, but everything was a little on the soft side. It could have used some nuts, or maybe a lettuce with more crispiness (romaine, endive, you know what I mean). Nobody complained, and there was a little tussling over the last bits of salad in the bowl, but I noticed. I asked my husband what he thought, and first he gave me the raised eyebrow “are you crazy?” look, but then he conceded, that yes, crunchiness is good. So, I deem this salad delicious and worthy of improvement. We had it as a side salad, but with the goat cheese (and toss some nuts in — candied pecans or something) I think it would be a very rich and delicious meal. This would be easy to pack to go. Just keep the dressing separate, add it when you’re ready to munch, fork toss (or put the lid back on and give it a few quick shakes), and enjoy.